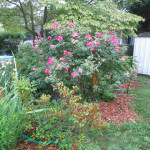 I just posted an update to the back yard and veggie garden but the front yard is shaping up as well. After 2 rounds of over-seeding, the grass is green and looking great. The holly is filling out nicely and we did add a large hydrangea to the corner of the yard. 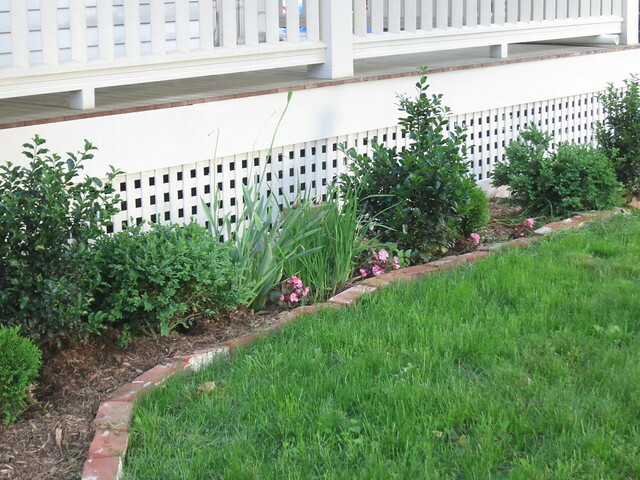 The boxwoods were a little droopy during last week’s heat wave but they are starting to perk up. The little globe arborvitae are happy and green. 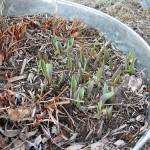 The irises don’t seem to get enough sun to bloom so I’m planning on moving them. What do you think should go in their place? Maybe a tall Bellflower? I was also thinking that maybe an obelisk with a Clematis would be kind of neat and different. 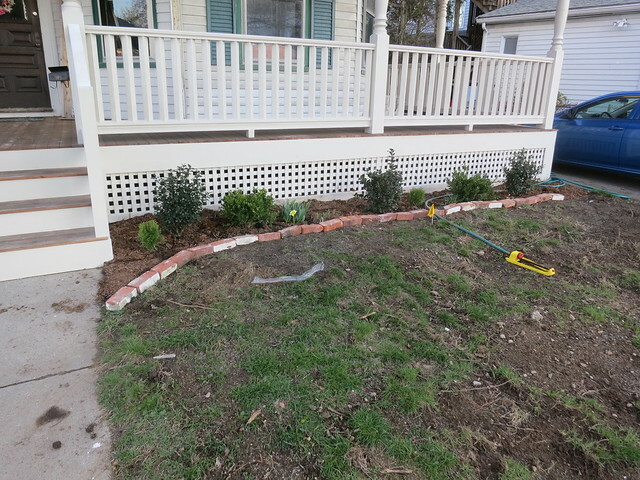 The curved brick edging to the bed on the right side of the yard is new since the last time I showed you. 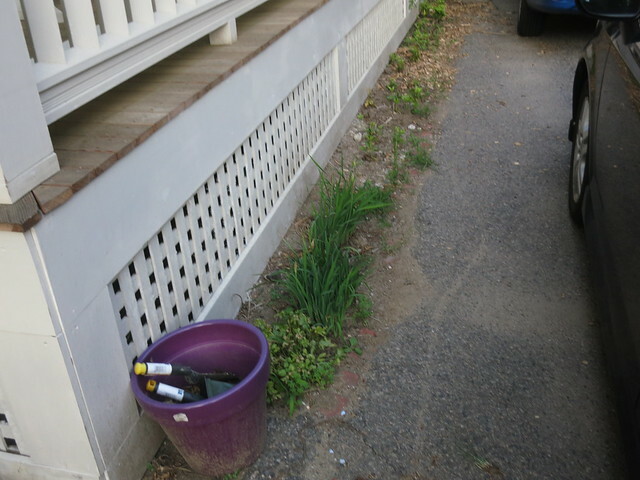 The bulbs are starting to die back but I’ve planted asters and shasta daisys that should take over. Along the narrow part of the bed, I’ve planted some purple phlox. On the side of the house between the porch and the driveway I planted a bunch of pachysandra that I picked up at the local garden club’s annual plant sale. 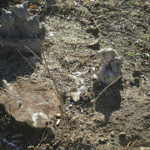 I had Allscapes come out and take care of our garden and yard. 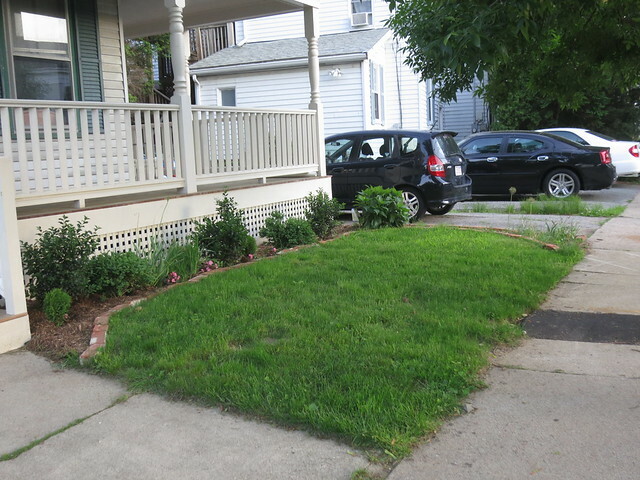 On the other side of the front yard, to the left of the sidewalk, the vinca minor (also known as Periwinkle or Creeping Myrtle) is doing well. We added 2 more flats of Bowles variety to supplement the one we added last year and the selection we purchased from Burgess this winter. The PeeGee hydrangea we purchased from Burgess is doing great but I’m not confident it will bloom this year. It does look healthy and green even if it’s still small. The Pink flowers are Columbines. I’ve got three clumps of the columbines and I’ve been very pleased with how well they are doing in this spot. 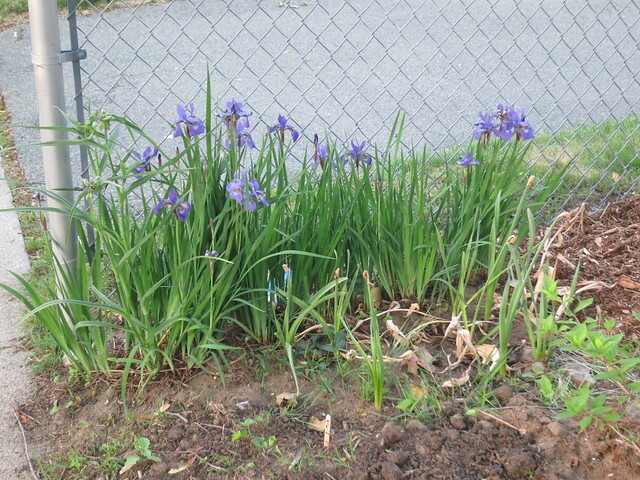 Along the chain link fence, I planted a bunch of iris I got from a lady on a local mailing list last fall. They are doing great in that spot. I plan on moving the iris I had in other areas to continue the irises along the fence since they seem to be doing well there. A variety of hostas round out the area. I’m also planning on planting a bunch of petunias to try to keep the weeds out this year. 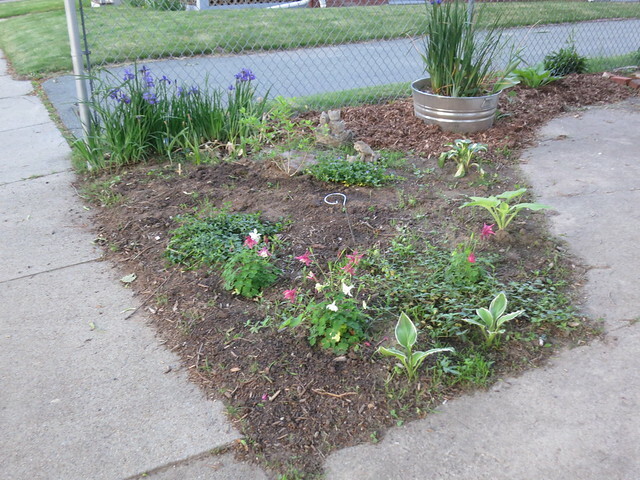 The Vinca takes time to grow and it won’t fill out the bed enough to supress weeds for another year or two. The parking strip is another matter entirely. 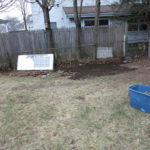 It’s time for us to plant something there to keep it low-maintainance and relatively week-free. There are a couple concerns with this area the first being the traffic this area gets. 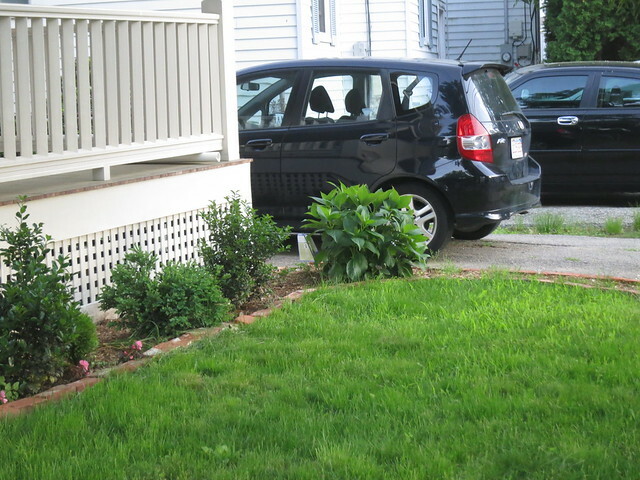 There is a car parked in front of our house nearly every day. There is a parenting class center down the street and there is a lot of newborns and stroller traffic on that strip. 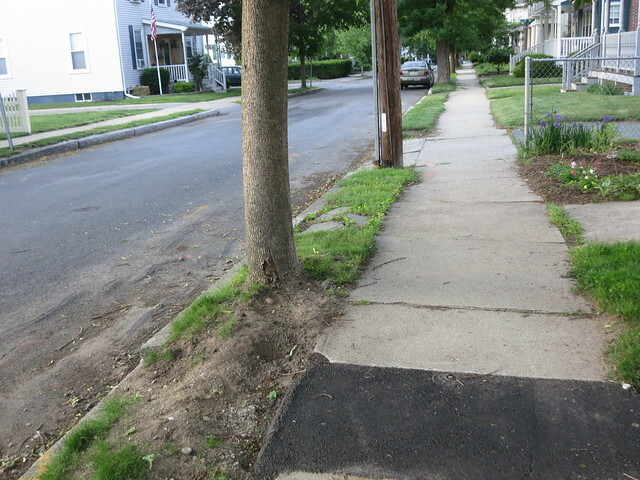 I’ve got half a mind to plant one of those low-growing junipers that is really scratchy just to keep people from walking on the area. “Get of the lawn!” kind of a thing. 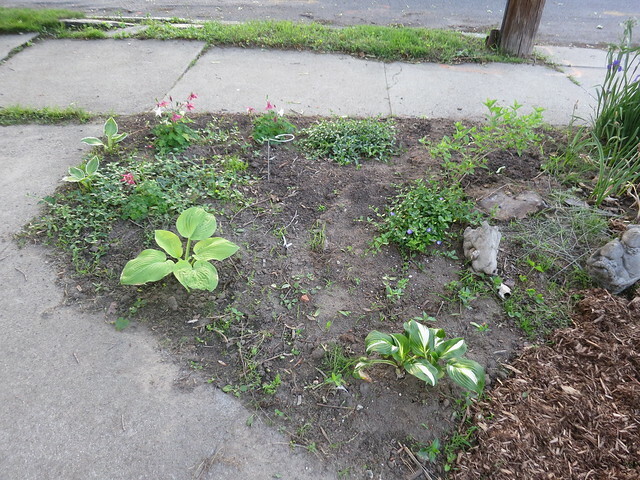 Hostas is another viable option. Lilies would also work great. The tiger lilies are native around here and do fairly well. I love the pink daylilies that my grandmother used to grow. The lilies do break up my purple and white color scheme though I’m sure I could find white lilies if I looked hard enough. What do you think would be good for the parking strip? 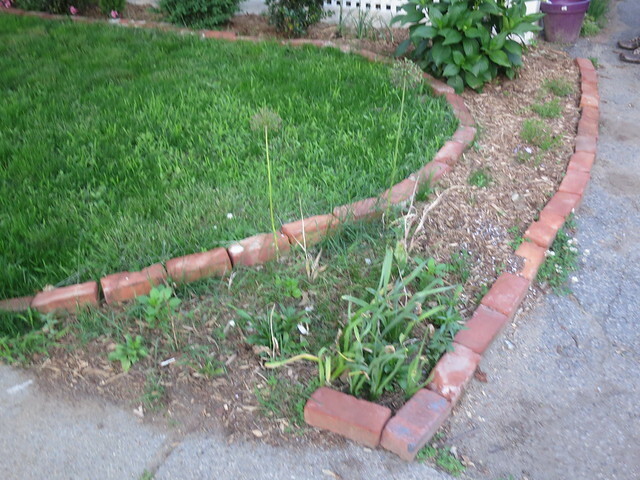 Would you plant it or just leave it a weedy grassy knoll? So lets review what all I’d like to do to the front. As always, I’ll post my progress. Please let me know what you think in the comments! Just look how good this looks compared to just a few months ago! It looks great. I love those old bricks. I wish I had some. How do you have the time and energy for all this gardening? I wish you could come help me. It helps that it’s not a million degrees here! I just see so little of the sun that any chance to be outside is first thing on my list!